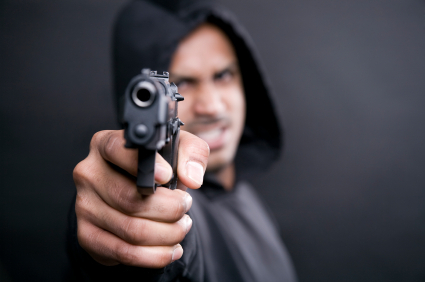 Robbery is the taking of property from another person by the use of force, intimidation, or the threat of force. If the robbery is committed with a firearm or other weapon, it may constitute armed robbery, which often includes a more severe penalty. It should be noted that robbery is often confused with Burglary, the breaking and entering of a structure. Robbery is committed when during a theft the individual causes physical harm to another human being or places that person in actual fear for their safety. Aggravated robbery is the taking of anything of value belonging to another from the person of another or that is in the immediate control of another when the offender intentionally inflicts serious bodily injury. While robbery is the act of depriving someone of their personal property while in their presence through the use of force or fear, the property can either be taken from the person or from their immediate surroundings. If a deadly weapon such as a gun is used or the victim suffers physical harm, the act can be classified as "armed" or "aggravated" and the severity of the punishment can be increased. The actual elements of theft include trespassing, taking, carrying away, the fact that it is someone else's property, the intent to steal, the presence of the person who owns the property, and intimidation. Unless all seven of these elements are present, theft as defined by the law, does not occur. If you are accused of robbery you should speak to a criminal defense lawyer immediately to learn more about your rights, your defenses, and the complicated legal system. The Sheena Law Firm has the experience and knowledge to help defend you. Call us today to discuss your case.